During the holiday sales, I was able to purchase a Benefit Creaseless Cream Eyeshadow and try it. I've seen many reviews and swatches but never actually went and got one. I have tons of MAC paintpots, so I didn't need to get one. So when I found "Recess" on sale, it had to get it! Here's the review! "Our do-it-all cream shadow lines, shades and contours eyes with its alluring crease-proof, smudge-proof formula." Overall, I do like the product. They are very similar to MAC paint pots, but has their own consistency to the cream. I have been using this one in particular as a base and its alright. I should probably try other colors to as I have been eying them as well, but gotta save up so I can get them. This product retails for about $19 which is a bit expensive, but there is enough product in jar to last a very long time, as long as it doesn't dry out. So far so good for me and I do like the product. 1. I find that keeping the jars upside down. This helps with organization and most of all keeps the moisture at the top of the jar when upside down. 2. This color in "Recess" is an awesome matte toned color that also be used as a concealer. 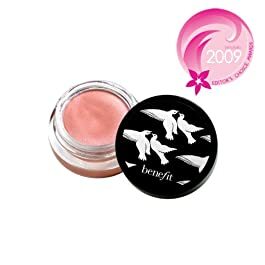 This product is available at benefit.com, sephora.com, and any Sephora store. I've been looking for Recess actually, I'll definitely buy it but couldn't find it yet! I recently got Honey Bunny and Birthday Suit. Didn't like Honey Bunny much though. Skinny Jeans is another winner. I actually love these. I wear them on those days when I'm not feeling like putting on anything heavy. I own 3 shades, 2 of which I picked up around Christmas 2 for $10- can't beat that! Thanks for the review! !It was so helpfull!! !